Another Great Row At Wells. Sunday 7th April dawned dull and misty with only a fleeting view of the Watch House. Would there be a morning outing? After a brief discussion, it was decided to go for it. Catherine, Madeleine, Carol, Diana and Barry swiftly took their seats before hauling two sailing boats towards windier conditions nearer the end of the cut. A good way to limber up! The water was calm, just right for the crew to work on timing, but visibility called for great care and attention. Nevertheless, there was still the chance for a well earned refreshment break – drifting in the silence eating chocolate biscuits and apricots. Then, a quick visit to chat to sailing club members on Lapwing and we set off home at high tide. The ladies kept an excellent pace back towards the slipway and the journey passed quickly. Coffee was shared and stories were exchanged on the Carnser. A very enjoyable outing! CRAB Social At The Langham Bluebell. The Langham Bluebell provided the setting for the second CRAB Social on Friday 5th April. It was great to see so many members turn up to chat and eat in pleasant surroundings. Good food, good company, looking forward to the next one. 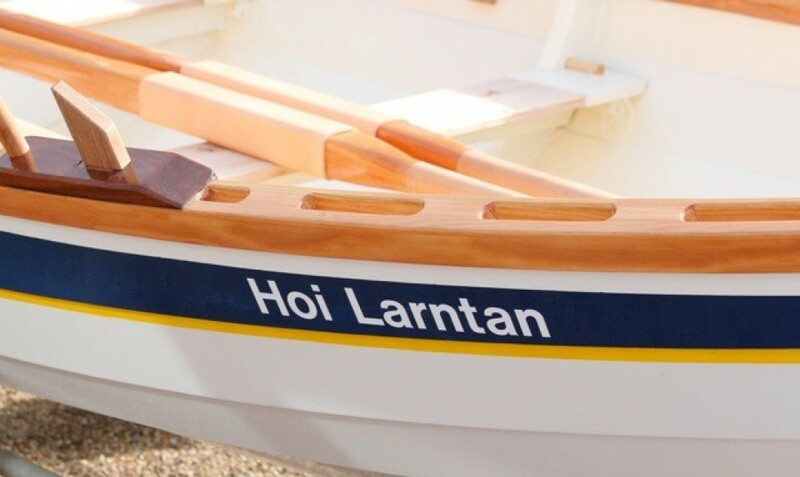 Monday 1st April saw a great event which signified the official beginning of the Blakeney rowing season: the blessing of “Bluejacket”, “Hoi Larntan”, “Petrel” as well as Victoria’s sculling craft. Members and supporters gathered on the Carnser to witness Tom H offering three toasts associated with Blakeney before organising a ceremony in which everyone could participate. Many thanks to the contributors of bubbly and glasses. There was ample opportunity to sample cake and drink before and after the blessing. This made the whole event pass really pleasantly and brought Crabbers together. Thanks also to the providers of some excellent chocolate and fruit cake. Both skiffs were taken for an outing after the ceremony and this finished the event in style. More Pictures From The Wells Row. Many thanks to Lynne for these great pictures of Diana, Amy, Anta and Barry rowing against strongish winds out of Wells Harbour, ably guided by Adrian. The photographs enhance memories of a great row. Adrian, Diana, Anta, Amy and Barry ventured into Wells on Saturday 31st March due to a lack of water in Blakeney. Conditions were sunny but blustery and bracing. After the steep slipway was expertly negotiated thanks to Adrian’s reversing skills, the crew set a steady pace along the winding harbour channel. Walkers on the path leading to Wells Beach gained a good view of Crabbers in action. Soon the open sea was in full sight, with white breakers, and so were the famous beach huts. After taking in the beauty of the surroundings, a turn was made and the crew made for the confines of the harbour once more. Thanks to Adrian and Anta for sharing coxing duties. Thanks also to Lynne for providing shore support. It was a great afternoon’s rowing. Last Row Of The Barton Season. Thanks once again to Alan C for the words and also for towing the skiff safely. Welcome to Pauline and Terry on their first row. “Last row of 2018/19 to How Hill and first row for Pauline and Terry. Safety instructions duly given, initial rowing guidance given, “come forward to row, row” and that was all that was necessary. The timings were nearly spot on, we pulled together as a team almost from the word go! Stephen occupied stroke position and Sue the bow position; she said she surprised herself at how comfortable she had found it. Stephen set a slow and steady rate, we glided over the water. Alan had very little to do as cox! On Barton Broad the sailing club had set up its committee station ready for the coming races. We even noticed the channel markers were being painted. As several leisure cruisers passed by, we received and gave salutes to each other. No fishermen were seen as its now the closed season! A lovely break at How Hill where we enjoyed Pauline’s Almond slice –thanks Pauline. Sue coxed the return leg, which was over all too quickly –nothing to do with Sue directing us to power up for ten strokes during which time the boat did indeed move significantly faster…..